high hopes//panic at the disco! Everyone goes through a Panic at the Disco! phase, right? I had mine a year or so again, but it’s been well and truly reignited with the release of his new album, Pray for the Wicked. High Hopes alwayyys gets me awkward-robot-dancing in my desk chair (doing this as I type) and I love the chorus and the little brass bits. Other highlights from the album (aka the only other songs I’ve heard) are Say Amen (Saturday Night) and Dancing’s Not A Crime. After not loving the first release from Alessia Cara since 2016 (:(() I’m very glad she then released A Little More, which I’ve listened to a ridiculous amount of times. It’s not the cheeriest song, but it’s chilled and is nice in the evenings. This was co-written by Ed Sheeran, and you can definitely hear his influence, but it also feels fresh. It’s a good walking soundtrack, and I just really like it to be honest. Not got much more to say. Let me start by stating that Mamma Mia: Here We Go Again! is a true masterpiece of modern cinema (and I did film at college so I’m 100% qualified to make that statement). I loved it so much I’m going to see it for the second time next week with friends, and I’ve been listening to these songs on repeat, especially when I’m not in the best mood and want to cheer myself up. I found this either in Spotify’s Discover Weekly or New Releases, and the only other song of theirs I’ve heard is Fixed, but I definitely think I need to keep a closer eye on their music – I like everything I’ve heard so far! What songs have you been listening to in July? Thoughts on my favourites? I’ve only recently curated my April-and-May-and-June playlist into one that just has the stuff I’m enjoying in June, so I figured I’d set myself the challenge of narrowing it down even further, from 168 songs to my top ten. I’m also going to predict there’s a 98% chance there’ll be more than 10 songs on this list by the end of it, but a girl can try and be decisive. Going straight in there and breaking my own self-created rules, I’m gonna just say 75% of Ed Sheeran’s discography – I saw him live in Cardiff last week and ever since I’ve been stuck in that phase of rediscovering every song he’s ever released and how much I love the all. Current favourites are definitely You Need Me I Don’t Need You, UNI and New Man, though. omg. this song. is one that I very much like and I’ve not had enough chance to talk about with other people, so if you’re also a Bastille nerd then hello please can we discuss how good this song is. I’ve almost definitely put this in a playlist on here before but in the last few weeks especially, it’s become my go-to song to make me feel summery. I found this song while listening to Radio 2 (I feel old, just to clarify it was not my choice of radio station), and thanks to the wonders of Shazam now being built into Snapchat, a Spotify-streaming-love-affair began. I went through a bit of a TKAK phase a few years ago but I haven’t really liked/heard much of their stuff since then. Spiritual Dark Age has been the first thing to really catch my ear and earn its place onto my monthly playlist (which is highly selective, as you can tell by the approx. 170 song length…), and I definitely recommend it for something a bit more chilled but happy. I don’t know what it is about this song over others on her album, but this has become such an earworm for me, and also regularly makes me dance (and as people who know me can testify, I do not dance when sober, so that’s quite a feat). Not gonna lie, I first found this song when my best friend was spamming me with ~girl power anthems~ after a breakup, but this is the main one that’s transferred from the ‘yasss you can do this’ pep talk playlist to my everyday one. It’s sassy and brilliant, though that may be more just because it’s Paloma Faith. So I know reputation came out approximately forever ago, and I listened to it then and then just kinda forgot about it, but Delicate has suddenly popped up again and become a solid favourite. This is another post-breakup banger and it’s also something that makes me sing out loud, and a bit like sober dancing, that never happens. Another Radio 2 find (oh no), this is another summery fun song that just puts me in a great mood. I know someone who saw Tom Grennan live a few months ago, and I am very jealous because this is now one of my favourite songs ever. And yes, I’m all too aware I’ve said that about at least 50% of this playlist so far. Another classic Kygo banger, don’t think any more description is needed really. Jonas Blue’s always been very take-it-or-leave-it for me, but something about this track has really caught my attention. Again it’s just a song that makes me happy, which is good enough for me. Andddd that’s it, with only five extra songs (pretty good for me and my indecisiveness…). What are your thoughts on my picks, and what have you been listening to lately? I’ve had a few ideas for blog posts tumbling around in my head lately, and although this wasn’t the first one I came up with – that was some top tips for doing the IB, but given my current stress level it may be best to leave that until after my exams – this album has been on repeat in my head for the last few days and is a completely unexpected new favourite of mine. Partly unexpected because its very, very rare for me to listen to a full album (even more so for me to like everything on it) and partly because…well, it’s Harry Styles, of One Direction fame. I never loved One Direction – though equally I didn’t understand the depths with which some people hated them – and didn’t pay much attention to any of their debut stuff when it first came up. A couple of their solo singles made it onto my Spotify playlists, but I made no effort to go and listen to full albums or anything. This is quite a chilled, laidback start to the album and wasn’t a track I particularly paid attention to start with but, though it’s not one of my favourites, has grown on me a lot. It’s easy to listen to and relaxing and I love the chorus – I think it does a really good job of livening the track up a bit without losing the dreamy feeling of the rest of it. It also opens up the album immediately showing that this is not going to be a One Direction clone, which is nice. This song is probably what actually stopped me from bothering to look into his music before because I was profoundly unbothered by it when it first came out as his debut single. It was OK, a bit different from One Direction but nothing drastic. Listening to it now I definitely like it more than I did then but it’s probably one of my least favourites on the album. The dramatic strings from 1:33 onwards get a shoutout though, and I discovered that it is actually him being suspended from a helicopter in the music video, not a stunt double, which is pretty incredible. Carolina’s the third track on the album and from its opening notes its showing a different side to ‘solo Harry’ – a bit funkier, a bit livelier, a bit less restrained. The opening riff’s the kinda thing you can’t listen to without letting your head bop along (bop is a fantastic verb and this song is very deserving of its use) and as the layers start to build it just gets funkier (I especially love the little ‘oh yeah’s). The vocals start off pretty laidback but quickly ramp up at the chorus, giving it more of a rock-y vibe than the first few tracks. Then the brilliant ‘la la las’ start up, giving the song a really fun vibe – Harry said in an interview that this was the last song written for the album and gave it a kinda missing piece of fun, which is definitely how it feels. The layers keep building up and, in my entirely objective opinion, the song just gets better and better – it definitely cheers me up in the middle of revision, anyway! Also, love the guitar on this. If you’ve heard of this song, you likely know it as ‘the one about Taylor Swift’. This is another one I really like, and I can personally really relate to the lyrics. Musically, the little guitar riff throughout is beautiful, and the return to the more laidback vibe provides a really nice contrast to Carolina. I’d definitely say it’s more pop-y, more along the lines of some of One Direction’s stuff, but that’s absolutely not a bad thing. Sweet Creature‘s another more chilled one, but a little more folk-y? (I’m not very good at identifying musical genres so feel free to tell me there is absolutely nothing folk-like about it at all haha) It’s similar-ish to Two Ghosts and just a really nice, laidback song for a Sunday evening, and I especially like all the backing vocal bits around 2:30. So the opening to this track is pretty misleading about the overall vibe of it, as it quickly changes into being much more rock-like. This is one that kinda escaped my notice at first, but now I absolutely love it – it’s great for yelling along to in the kitchen while baking cookies (absolutely not that I was doing that ten minutes ago…). It’s veryyyy different to One Direction and more along the lines of Carolina, once again with great backing vocals and clapping bits, and the little instrumental bit around 3:15 is one of my favourite things in the world right now. This is one of my absolute favourite songs at the moment, and it’s the most non-One-Direction like one on the album – Harry said himself that it started out as a joke but ended up as one of his favourite songs, which kinda explains the lyrics a bit! Similarly to Only Angel it’s great for just yelling along to (very handy stress reliever for a currently very stressed student with exams in three days) and has kinda become my personal hype song? I don’t know how either, but I’m not disappointed. For the optimum first listening experience, I recommend playing it as loud as you can. Side note – I really love the bridge. I wouldn’t say this is one of the stand-out memorable tracks on the album, but its got a lot of good stuff going on (even if the very opening does remind me of the music they use at the start of lots of programmes about schools on TV – just me?!) It’s apparently thought to be about his stepdad’s cancer diagnosis which adds a whole different level of poignancy to the lyrics – my favourite is probably ‘There’s no water in this swimming pool’ (I always love a good water metaphor). It’s obviously quite a sad song, but in a way that feels chilled out rather than full-on make-you-cry, which is nice. First things first – I LOVE the opening guitar motif. I know I’ve said that about basically every track on the album but its all true, okay?!? This is definitely one of my favourites, and like Two Ghosts, I can really relate to the theme of the song. This is definitely not one to cheer you up, but its the kinda song that makes me really think and gets me in the feels, as the ~youth~ say. I also love the change in melody around ‘maybe one day you’ll call me and tell me that you’re sorry too’ – there’s just something about it that I really love, as well as the poignancy with ‘but you, you never do’. I just think the whole song does a really good job of capturing heartbreak without trivialising it or being clichéd. What are your thoughts on Harry Styles’ solo music? Inhale Kate Miller – I found this on Spotify ages ago from a Buzzfeed playlist but never really listened to it much till this month, when it’s become one of my go-to songs for walking to college. what songs have you been listening to this month? What’ve you been listening to this month? 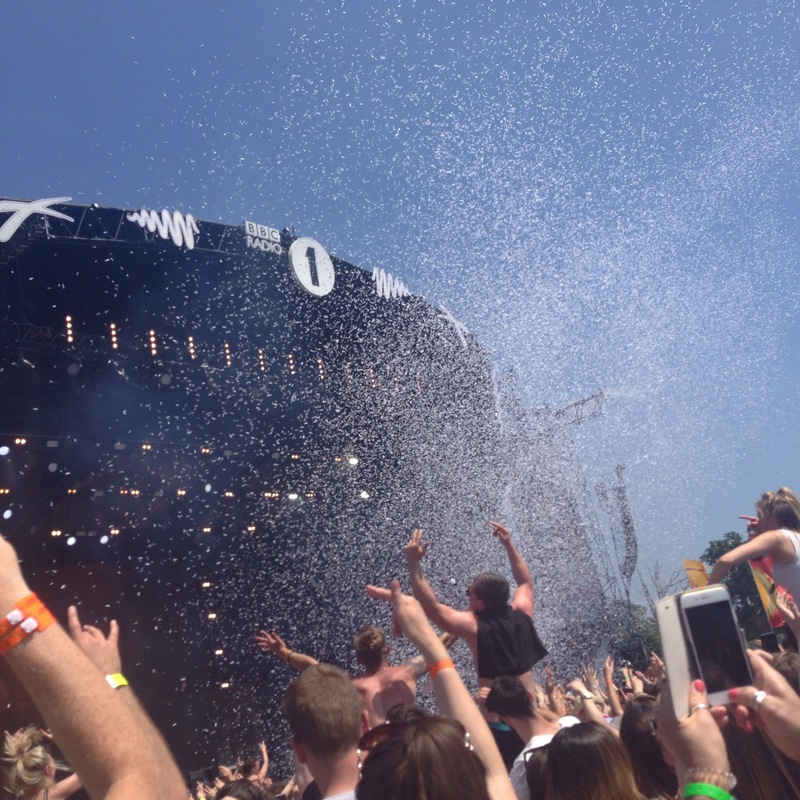 This, as well as the previous two, were all chosen from the Radio 1 Big Weekend back in May. One Republic, Kygo and Coldplay were all amazing, and that weekend was just a real highlight of my whole year – Thursday was my birthday, Friday I had a birthday meal out with friends, Saturday I did a charity 5K with a friend and then on Sunday I went to Big Weekend with so many friends, which was amazing. This and Talk Dirty date back to prom specifically, but really encompass my last three years at school…Talk Dirty has a very specific memory from our Year 9 battlefields trip that involves some ~interesting~ dancing, and Anaconda has music GCSE memories and a lot more attached. I think this has been played at every party I went to this summer, and every time it was amazing. Such a classic. I remember everyone wanting to hear this at the end of one party, but not being able to find it, then it ended up making me cry at the last party of the summer because a) it always makes me emotional and b) ALL THE FEELS about leaving school and my friends and it all just kinda hit then. Same as Bonkers. And everybody always knows the words so it just turns into singalong squad goals. This and Step Into The Light remind me of a couple of days with two of my best friends between my trips to Holland and Scotland, when we went swimming at a local lido and absolutely froze and then had the best evening attempting hair chalking and just having a laugh. It’s hard to do it justice in words but it was just so, so fun. This is for one of my best friends and her amazing talent that we discovered at a party – she can rap the entire thing, even under the influence of alcohol, word for word. It’s pretty impressive, ngl. Same as above, except it was just aforementioned best friend and my boyfriend singing and we were all stood there like ‘how do you know these words’. Fun times. Same party, but at this point we were all sat round the fire with a guitar singing a bit of Oasis, as you do. For some reason I can remember that this was on the radio when we were coming back from a beach trip, and yeah, it just reminds me of that trip. This reminds me of driving back when my sister picked me up from work on a really sunny day and we got McDonalds and this song was on the radio or we were talking about it or something and for once we weren’t really arguing. I had to include this because a) Lauren’s debut album finally came out this summer and omg it was amazing and b) I had the best time reviewing it with Eve. The most recent addition, I played this in jazz band yesterday. It’s 70s disco from Saturday Night Fever and the strings are just amazing and it’s just amazing. Are there any particular songs you associate with your summer? Which of these songs is your favourite? I wasn’t really that keen on this the first time I heard it, but I definitely think its grown on me. I really like how the texture thickens before the first chorus, it feels like it makes it more powerful and I also quite like the new-era Aquilina electronicy vibe. Also, likemost of her songs, the lyricism is amazing…especially ‘it’s just the lonely talking’, and ‘We’re in too deep, so let go of my hand”. Eve:I wasn’t as keen on this on on my first listen — like, when they were released earlier? I think I was feeling a bit negative about all the electronic production compared to Lauren;s old stuff. BUT BUT BUT now I do really enjoy this one, especially the chorus! It’s VERY catchy. And I also love the whole ‘midnight mouths’ and the aesthetic of it haha. I’ve been thinking about death/But I’ll hold my breath’. Eve: I absolutely ADORE this one honestly, and I do feel like this is a more grown-up song on this album. But asdfjkl the lyrics are so wonderful (‘I’ve been thinking about death but I’ll hold my breath’ arghh). SPOOKY. Basically the high notes on the chorus just give me the chills every time. man I do just really love this song eek. I love this song so much, ever since I first heard it, and the lyrics are just OMG AMAZING. ALSO KICKS = KICKING ME AROUND = PUNS/WORDPLAY = LOVE. (*pause for Eve and I to flail about amazing wordplay*). Plus yay for positivity, especially ‘I’m done being down about this’…and I also like the more modern-y electronicy-ness. Overall this song feels more mature, and the message feels less naive than some of the old-era Aquilina songs. I love this song so much! It’s more stripped-back and that makes it a nice contrast to the rest of the album and lets the emotion really shine through…it feels very raw and powerful and again, even if not in this context/situation i feel like the whole ‘how would you like it’ message is very relatable and applicable in a number of contexts, which I really like. Eve: Also gives me the chills. This is one I loved from first listen, I think — although it’s only improved with listening. WOW SO MUCH EMOTION. So much lyrics. And I think the more stripped production works well here. (*is feeling so many things as I listen to chorus woah*) . I also…find myself singing this a lot? Yeah. And THE BRIDGE IS SO WONDERFUL. Okay I absolutely LOVE this song (such sad times when my boyfriend said it sounded like a ‘crappy christmas song’ like oi no this song is a masterpiece. The lyrics are so good and the stripped-down-ness really works well but for me the main thing about this song is the lyrics. I especially like ‘If nothing is meant to last maybe we should drink to that’. I can totally relate to the feeling that everythings too good and something’s going to go wrong. The start is so good! A real contrast to the last one but it works really well, then the slowing down at the chorus and yes again the contrast between tempo and melody and lyrics. I also just love the melody of ‘why did you have to let me let you in’. Yep it’s amazing and I also like that it *feels* happy even though it def isn’t, kinda bittersweet, as Eve put it. Eve: This one…also SO GOOD. *cries* (way too good even) (ha) (anyway) I also really enjoy listening to the pre-chorus bit? Like, I LOVE THAT. ‘this was never love it was chaos’ is such a fabulous line. And yep, the contrast between the tempo of chorus and the rest is so wonderful, works very effectively. I also feel like ‘I gave everything expecting nothing’ is a bit of a theme across some of the songs? (Idk, i feel like there was a similar line somewhere haha.) YES overall honestly this is also absolutely stellar a+. I read somewhere that she rerecorded Fools because her voice has changed and I also agree with something else she said, about the way she sings it now is more serious and less naive because she knows how the relationship ends. Also can we please have a round of applause that she wrote this aged 16?!?! (how can she do this, GCSE music composition was hard enough!!!) Also, it’s very stripped back and bare, maybe because it’s live? Also, because this was one of the first songs she ever released, it feels like quite an important one in her career so it’s nice to have that on the album. Ahh this is just WAY TOO GOOD (wink wink nudge nudge). One reason I really love this song is because just before the album announcement she put on facebook etc a thing about how people can go from so close to completely separate so fast…I also love the ‘isn’t it strange’ line. And ‘from talking every waking hour to not knowing where you are now’ line…and it also feels very relatable because of the fear of how a relationship is going to eventually end. This feels very pared down, there aren’t many lines or backing but it still feels quite powerful…side note is it me or has the album got more pared down and simplistic and almost darker the further down the tracklist you go? It’s like it follows a relationship’s journey or something, and at the end it’s like the problems are more serious & unavoidable. Overall, I wouldn’t say it’s my favourite song but “all i’m thinking about is not thinking about you” is one of my fave lines on the album i think. I definitely think it was an album worth waiting for, you can tell its not the first collection of songs she’s released and i really like it. It’s honestly amazing in my humble opinion. 10/10 methinks. Eve: One random thing I noticed about the whole album in general is that there are a lot more like specific third person pronouns used? I mean, not a LOT more. But there’s also like more than just ‘you’ n stuff which I found interesting. I feel like lyrically it’s less abstract; like still absolutely stunning lyrics but more cutting to the point and less vague imagery if you get me…? Honestly…tbh I adore every song on this. I think I do enjoy it more than the Ocean EP? Although Echoes was fab. 10/10 one of my fav recent albums i will be dying over this forever. And there you have it, a track-by-track, vaguely incoherent review/fangirl session of Lauren Aquilina’s debut album, Midnight Mouths! Have you heard the album? What were your thoughts, and which tracks do you especially like? And that is my grand return to blogging in a couple of paragraphs and thirty songs. Hopefully it won’t be so long until my next post! This whole album is so good, but my *absolute favourites* have to be Where I’m Going, Ghost, Gold, Helpless/Bloodlines Pt. II – Medley and Too Far Gone. They’re all just so good and relaxing and great though, kinda twenty one pilots-esque, so mega creds to my boyfriend for introducing me to them because they’re now one of my current favourite bands. I wouldn’t call either of these artists I especially like, they’re alright but that’s it, but I surprisingly like this song – it sticks in my head and ahh I just really like it. It’s kinda relaxed and chilled and I like it. Quick heads up: this song is SO. GOOD. for running to, as is Light It Up by Major Lazer feat. Nyla. This is also co-written by Alessia and she’s basically one of my favourite singers and songwriters ever so yeah, I was pretty much guaranteed to love this. The chorus of this is really catchy and I just love all of Ed Sheeran’s lyrics tbh. I think I might know the words to every song on this album, I love it so much. The songs and the songwriting and everything are just too perfect for words. This is one of my absolute favourite pieces to play on trumpet, and listening to it isn’t half bad either. aaanddd I’m going to stop there before I add anything else…why am I so incapable of making short playlists?!? What are your thoughts on my picks? What music have you been especially loving lately? Wahey, wahoo, callooh, callay (sneaky Rainbow Rowell reference totally intended), I’m back and alive and blogging again, yay. (I didn’t die or anything, just, y’know, GCSEs…although my social life has improved dramatically during exams, which I’m pretty sure isn’t meant to happen). I technically went with two of my friends, though by the end of the day we’d picked up four more and kinda temporarily met a bunch of others – because it was such a local festival, it felt like half the people I’d ever met were there, which was quite nice. Anyway, we went on the Sunday, and after arriving, getting food because we’re teenagers and permanently hungry and meeting up with the others, we headed to the main stage, we watched One Republic, who were actually a lot better than expected…as they were the openers for some reason I didn’t think they’d be that great, but they actually completely surpassed my expectations. After OneRepublic more food was bought because some people didn’t get round to having breakfast and why not, and then we met up with five or six more friends to watch Kygo at the main stage while a couple of people went to see Panic! At The Disco on the In New Music We Trust stage. Kygo was just as good as I’d hoped (though not quite as good as when I saw him on his Cloud Nine tour in London) and there was a suitable amount of confetti…we all just stood in a line a bit off to the side of the stage and danced for the whole set, so yeah, that was a laugh. After Kygo, the group shrunk back to being five of us and we went to the INMWT tent to watch Jack Garratt, though we only managed the first fifteen or twenty minutes of his set because, well, the tent was hot and full and we all got a bit too sweaty, to put it bluntly, so we moved outside and sat in the shade for a half hour or so until Alessia Cara was due on (/we got sick of the Star Wars theme tune being played every time the ride next to us started). I think it was also here that we saw some people dressed as hot dogs/ice cream cones and a guy in short shorts and electric blue tights who made one of my friends get up and do the “hashtag dance” (FOR THE LOVE OF THE HASHTAG) so, uh, yeah. Alessia Cara was one of the artists I’d most been looking forward to (I think I might know all of the lyrics to the deluxe version of her Know-It-All album off by heart…) and she definitely lived up to my expectations. I just really love her music and how relatable her lyrics are and she seemed so down-to-earth when she was talking between songs, which was really nice (plus we were nearer the front but at the side, so there was less of a heat problem). I think my favourite songs of hers, from what I can remember, may have been Here, Scars To Your Beautiful or River of Tears (I swear part of the chord sequence of the latter is the same as some other really famous song, Snow Patrol or something, but I can’t quite figure it out and it’s seriously bugging me so if anyone can figure it out please feel free to put me out of my misery). Oh, and we briefly met about five more friends there so yeah, that was nice. After Alessia Cara we headed back to the main stage to watch Iggy Azalea who was, well, rubbish. You could tell because the camera never panned to the audience after the first five minutes because pretty much everyone was just stood there like is this over yet but hey, I got a decent photo of the stage so I’ll stick that in here anyway and we’ll just forget she ever actually performed. About halfway through Iggy four of us decided we’d had enough and headed back over to the INMWT stage (via the churros van because ahem who says no to churros and Belgian chocolate sauce? NOT ME, THAT’S FOR SURE) to meet back up with a friend we’d seen earlier and watch the first bit of Skepta’s set before heading back to the main stage for The 1975. In the end we only caught about two minutes of Skepta before we left so the friend we’d met up with, a diehard The 1975 fan, could get back to the main stage and as close to the front as possible for the start of their set which, incidentally, was quite good. Oh, by this point I think we’d also decided to invest in getting our faces PVA’d and glittered because hey, what better to spend £5 on? (it did look pretty damn awesome and the PVA smelled weirdly good (I’M NOT A GLUE SNIFFER PROMISE) and it came off surprisingly easily so yeah, it was worth it, even when it felt like half my face was covered in some weird face mask thing). Anyway, after The 1975 we met back up with the two friends we’d ditched for Skepta and got some lovely, slightly undercooked pizza and chips for dinner. Yum. We then just chilled in the sun whilst Ellie Goulding was on with even more people we knew that we found along the way, before heading back to the main stage for the end of The (very sweary) Weeknd’s set and to await Coldplay (YAY! ).